Successful bidders will have the opportunity to explore and then develop and produce blocs with ADNOC. Abu Dhabi National Oil Company (ADNOC) said on Tuesday it was launching a competitive exploration and production licensing round for six oil and gas blocks, its first ever. Two of the six blocks are offshore and four are onshore and estimates suggest they contain substantial amounts of oil and gas, ADNOC said in a statement. The successful bidders will enter into agreements granting exploration and development rights under terms that will be set out in the bidding package, it added. ADNOC has embarked on a major plan to privatize its services businesses, venture into oil trading and expand partnerships with strategic investors. The shake-up aims to make ADNOC more competitive and commercially focused, operating in a way that is more akin to other state-controlled peers. “The launch of these large new licensing blocks is an important step for Abu Dhabi and ADNOC as we develop and apply new strategies to realise the full potential of our resources, maximise value through competitive bidding and accelerate the exploration and development of new commercial opportunities,” ADNOC’s chief executive Sultan al-Jaber said. Bids are due by October and the first bidding round is expected to conclude this year. The six blocks comprise a total area of around 30,000 square kilometres. The blocks hold multi-billion barrels of oil and multi- trillion cubic feet of natural gas, Abdulmunim al-Kindy, head of upstream at ADNOC, said at a press conference in Abu Dhabi to announce the bidding round. A global technical and commercial roadshow for the new round will start on April 23 in Abu Dhabi. This will be followed by others in North American, European and Asian cities such as Houston on April 26, and Hong Kong on May 8, ADNOC said. Al-Jaber said ADNOC had received an overwhelming response to the bidding round from energy companies, both existing and new partners. He did not name any interested parties. ADNOC is to maintain a 60 per cent share during the production phase for the blocks, he added. 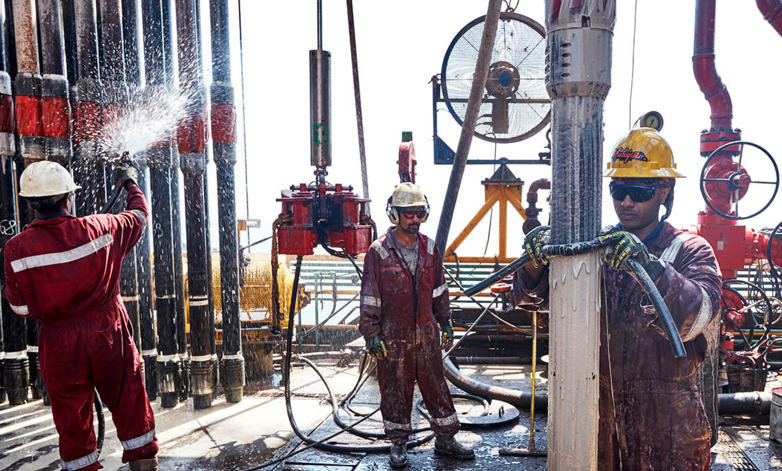 ADNOC pumps around 3 million barrels of oil per day, or about 3 per cent of global production. It also produces more than 9.8 billion cubic feet of raw gas per day, placing it among the largest energy producers in the world.